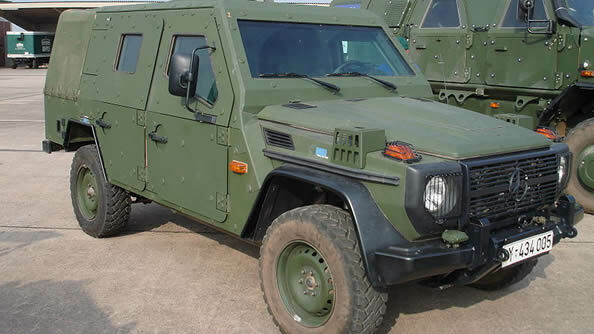 The German Mercedes-Benz 4×4 LAPV Enok (Light Armoured Patrol Vehicle) is an armoured military vehicle of the German Army. It is a significantly further developed Wolf SSA, based on the Mercedes-Benz G-Class. It meets the protection levels of NATO STANAG 4569 Level 2. The Enok was especially designed to be deployed in harsh terrains and bad weather situations making it ideal for operations in Afghanistan. A first batch of 247 vehicles has been ordered by the Bundeswehr, with deliveries between 2008 and 2013.